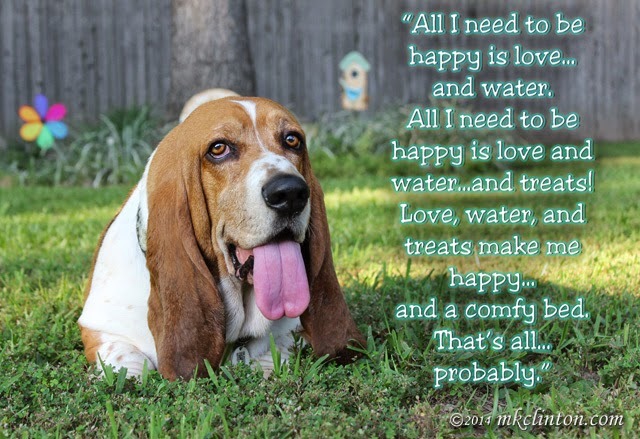 Join Rascal & Rocco, Love is being owned by a Husky, Basil the Bionic Cat, Jan’s Funny Farm, and me as we celebrate the one-year anniversary The Pet Parade!! 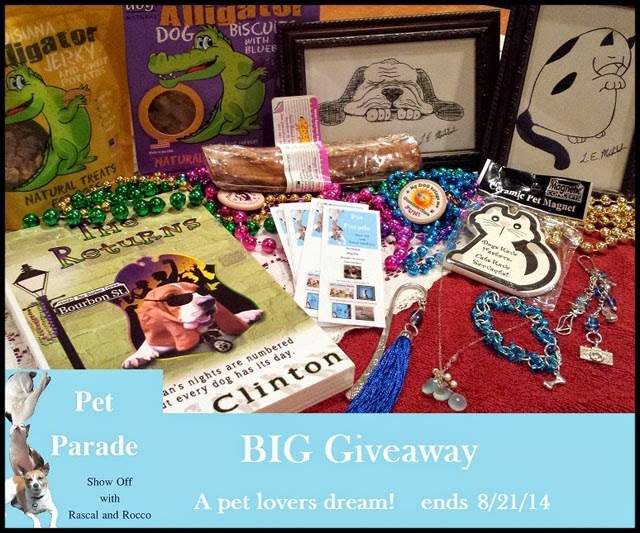 We are hosting a super terrific giveaway! That’s just how we roll! Enter for your chance to win on Rafflecopter below. Remember, you can’t win if you don’t enter. 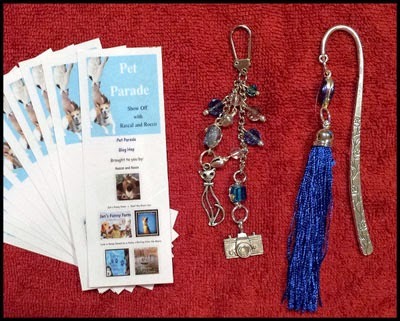 Here is a closer look at two of the prizes you might win in the Pet Parade Prize Package!! Love is all you need......now we have The Beatles in our head all morning LOL. Have a super Saturday. I love that happy tongue filled smile! It's made my day. Nice list of what you need to be happy, but I would have to add I need my mom and I need wabbits ;) Happy Weekend! Well, LOVE = Mom & Dad! I've never gotten to chase rabbits, but I do enjoy a good squirrel terrorrizing now and then! Bentley's SMILE is so cute...and quite big! I didn't realize he had such a loooong tongue. BOL Happy weekend! We had been playing outside. It was early evening, but the heat index was still like 103, so their tongues hung pretty low! BOL! 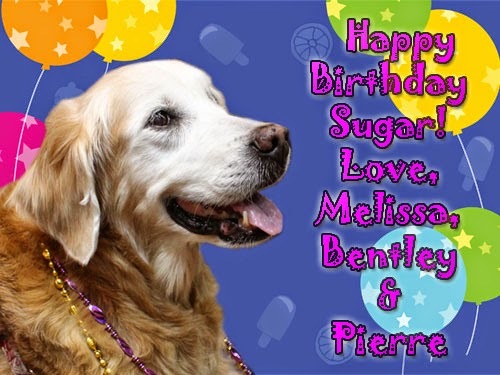 Love that photo of Bentley :-) And what a great birthday greeting for Sugar! What a GREAT smile for Sugar! What a Grand Post fur our FUREND Sugar. Beautiful! Sugar will LOVE it!! We hope so! Sugar deserves a kinds of happy birthday wishes. Awww!!! I wish humans were that easy to make happy!!! Yeah, it pretty much covers mom too! BOL!!!! I think you covered everything there, Bentley! What sweet birthday wishes for Sugar! sooooo manyt great things to celebrate!!! LOVE your Meme and I am sure Sugar loved her greeting! Have a pawesome day! I'm glad you liked it. Sometimes I go outside and ponder things! BOL! LOL! We loved that. All I need to be happy is my brother and my pawrents and my ball! Nellie can play bang and lay down and die. Happy one year Annv on the pet parade. Thanks Whitley! The one of you in the flowers is beautiful a wish for Sugar!! 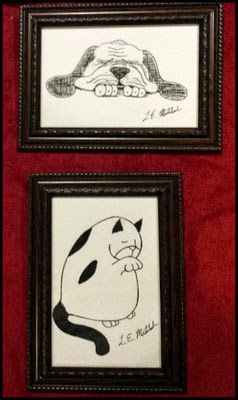 Those black and white drawings are sooo cute!